Hellow, yes that is what the title say! In Machi ★ Asobi Vol.13 in Tokushima, Japan, an auction was held for charity and it featured several animes items, but one was Hightlighted! 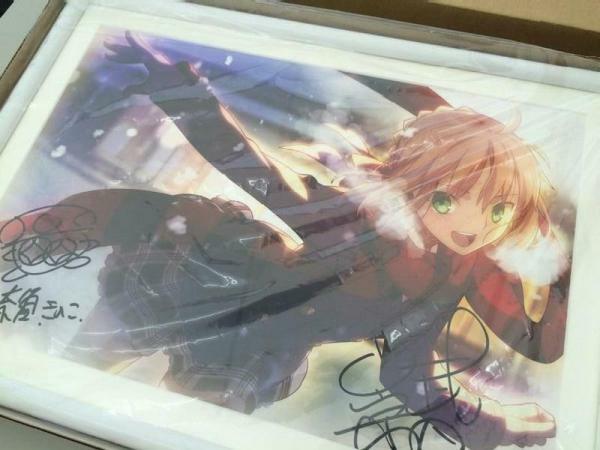 An autographed illustration by Type-Moon co-founder and original Fate/ Stay Night illustrator Takashi Takeuchi featuring the Fate series main heroine, Saber (King Arthur) has fetched a hefty sum of money which costs a whopping 620,000 yen, which is approximately US$5,800. This illustration was auctioned off with a simple frame and the price is twice that last year most expensive auctioned item, a Kara no Kyoukai illustration for 300,000 yen.